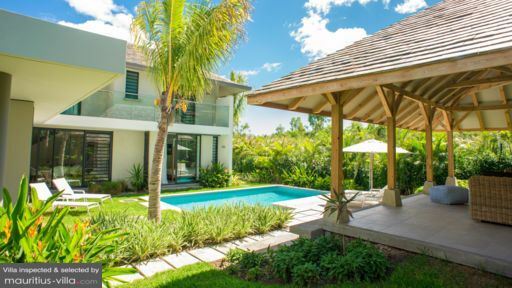 A sprawling two-story villa that’s practically brimming with style and comfort, Marguery Villa Deluxe embodies opulent luxury to ensure that your holiday in Mauritius goes as smoothly as possible. Boasting a gloriously manicured lush green lawn with gazebo and comfortable outdoor furniture, this villa radiates charm and coziness, creating the perfect home away from home for you. 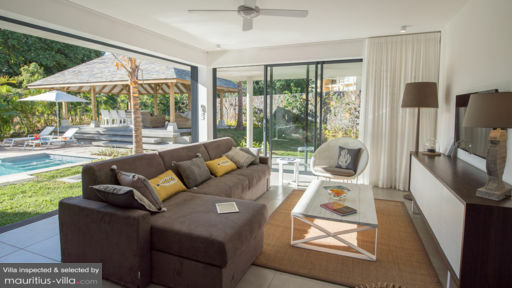 Spacious and airy, Marguery Villa Deluxe can very comfortably accommodate up to six guests. Marguery Villa Deluxe boasts a master bedroom and two guest rooms. All the bedrooms are air-conditioned, guaranteeing a refreshing slumber. Overlooking the garden, the master bedroom has its en-suite bathroom, complete with walk-in shower, bathtub, double sink and toilet. The master bedroom also includes a spacious walk-in closet. In the guest bedrooms, you’ll find twin beds that can be converted into double beds, should the need arise. Guest bathrooms feature a walk-in shower. Facilities such as hair-dryers are included in every bathroom. An absolute oasis of tranquility and relaxation, the emerald green foliage in the massive garden provides plenty of shade for you to relax. Guests will also find two sun beds where they can lie back and relax with their favorite drink as they work on their tan. In the garden, guests will also find a large swimming pool in which they can enjoy a refreshing dip after an active day of exploring the island. And in the evenings, you can take your meals out on the pavilion and enjoy the aromatic scent of tropical plants as you dine Al Fresco with your friends and family. At Marguery Villa Deluxe, guests will be able to enjoy spacious and sweeping living areas where they can relax on lazy days in. Equipped with ceiling fans to keep the island breeze at bay, the living room boasts comfortable furniture and satellite television. In the open-plan living area, you’ll also find a dining room table and chairs along with a fully-equipped kitchen with small appliances, fridge, induction hob, oven and microwave. Guests of Marguery Villa Deluxe can enjoy a whole array of services to ensure that their holiday in Mauritius is as restful as possible. For example, a concierge service is at your disposal during the entire duration of your stay to help you book whatever activities you want to indulge in. At the concierge, you can also book your daily breakfast, with a choice of vegetarian, full-English or continental. Additionally, you’ll also benefit from the services of a housekeeper and a gardener. Guests have exclusive access to the Club House, where they can enjoy delectable meals and various activities. Because the villa is located in the vibrant district of Black River, there’s always plenty for you to do in the nearby surroundings. 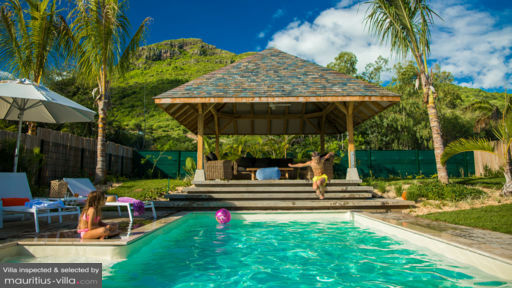 For example, Marguery Villa Deluxe is close to the scenic Le Morne beach and mountain, which is a UNESCO-recognized historical site in Mauritius. At the beach, you’ll be able to enjoy various types of sea activities such as snorkeling, SCUBA diving, parasailing, speed boats, glass bottom boats and even catamaran trips into the azure lagoon.